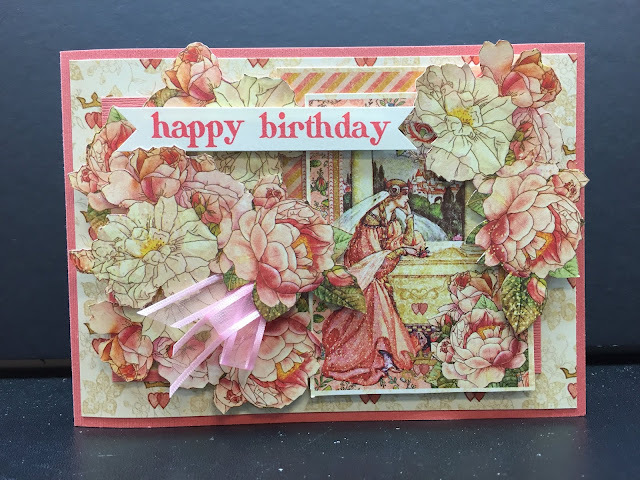 Today I am sharing with you another masculine birthday card made for a family member. I could have used masculine papers to create a card, but I was more in the mood for stamping. The challenge was that I do not have a whole lot of masculine stamps. Something to correct I guess. I went through the stamps that I have unpacked (some are in storage) and came up with the idea to use the Altenew 'Birds of a Feather' stamp and die set along with the leaves from the 'Hope' stamp and die set. Maybe use some Distress Oxide Salty Ocean as a background and see what I can come up with to make this card more on the masculine side. 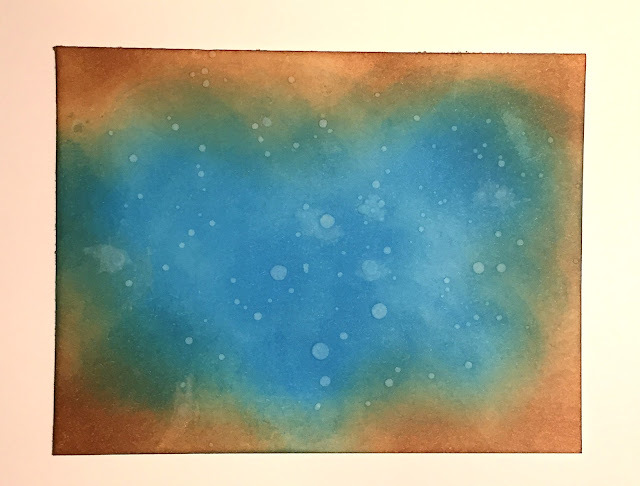 I thought I would start by showing you the background piece before I put the card together. I ended up adding Distress Gathered Twigs on the edges (I don't have it in the Oxide yet), and splattered a few water drops on the 'Salty Ocean'. This is how the card turned out. Now, if you are wondering why the NUVO Glitter drops look a little on the strange side, that is because I did not let them dry before taking the photos. I have a busy day ahead and had to take the photos this morning or wait till Wednesday. So I opted to photograph while they were still wet. So, do you think this looks masculine enough? I think so. 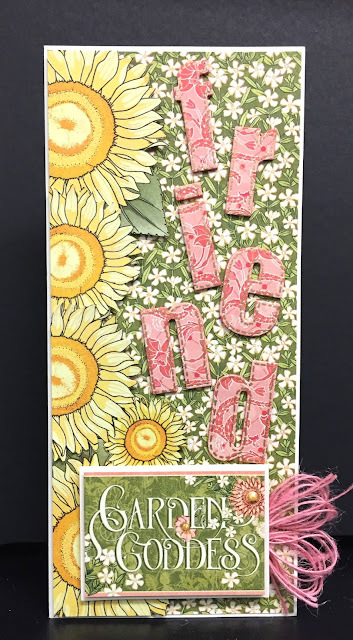 I also love the Butter yellow embossing powder I was able to use for the first time. I have some coloured embossing powders from about 5 years ago that I have never used because I was always busy using product for classes. In the above photo you can see that the only things that I popped up are the bird and the sentiment. Everything else is glued on leaving the edges free so that they lift up a bit. To lighten the birds tummy, I took a clean cloth and dabbed the belly lightly to get rid of some of the ink on the stamp before stamping. If you look at the feet of the bird (above) you can see that my stamping did not line up with die. It was the first time I used this stamp set, and hope the next time I can get it to work better for me. For my class samples I never do anything on the inside of the cards, but as this is a personal card I have added a little something on the inside. A benefit of doing so is twofold. It looks more finished on the inside and it gives the back of the card more stability balancing the front And back as it stands up. Especially for a top fold card. Hope you have enjoyed seeing this card. Below, I will link to some of the product used in the making of this card. 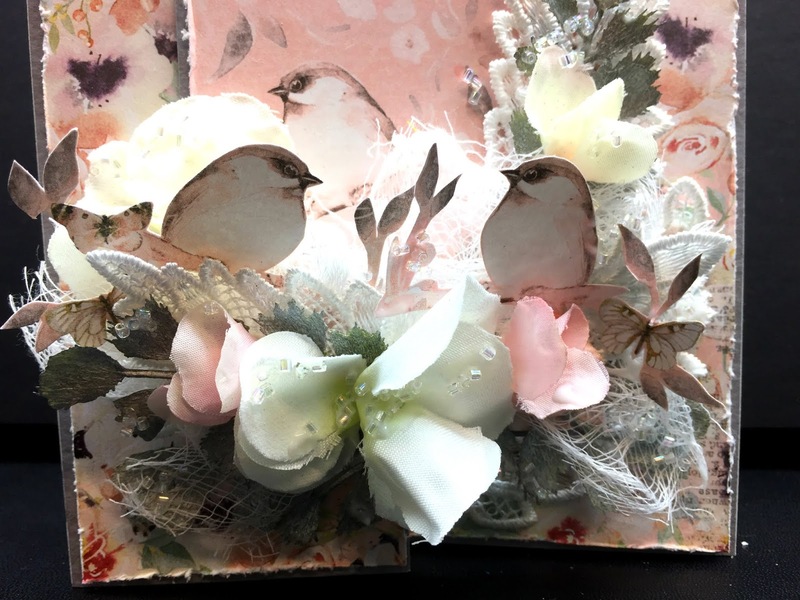 Thank you for stopping by, and happy creating! I am guessing that some of you are wondering why I haven't posted in a while. Well a lot has happened besides my move to Calgary, and I will leave it at that for now. Still working on getting some of my class designs scheduled, and those posts are waiting for class info before I can officially post them. I have really missed not having the time to create something. And I mean really miss it, but I haven't finished unpacking yet! This is due to the unexpected things that came up. But with a masculine family birthday upon the horizon, I said 'to heck with not having my craft room all set up', and created a quick card using leftover pieces of 49th & Market paper and some Creative Embellishments laser cut chipboard ferns. 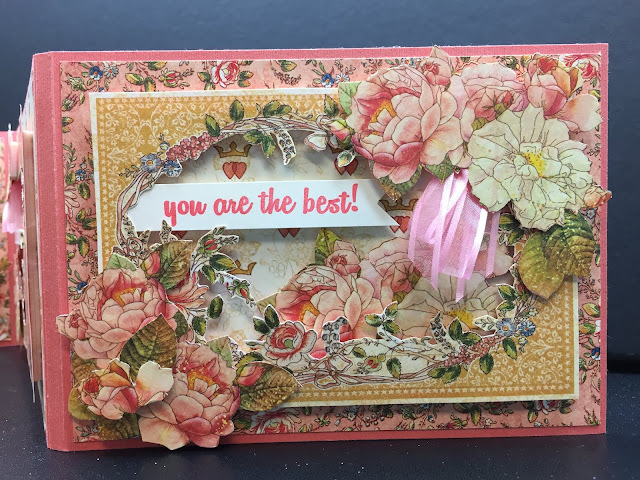 The heat embossed stamped sentiment is double heat embossed to give the gold a thicker look and more raised from the paper. I hope you can see that better in the following photo. The laser cut ferns from Creative Embellishments I covered with Seaspray Green NUVO Mousse and then when dry, brushed on some Indian Gold NUVO Mousse. I love the look of these patina metallic looking ferns. It helps to give it a little more a masculine look. Don't you think? Here is a closer look at some of the ferns. I wanted to use my gold Gel Pen around the edges of the lighter paper against the darker green, but found I have misplaced the pen. But my card is ready to go even without that for this early April masculine birthday. I hope you have enjoyed viewing this card, and feel free to share your thoughts on this card. Due to my move we are having to reschedule one of the classes recently posted. Also note the change of date the homework will be available to those taking the class. 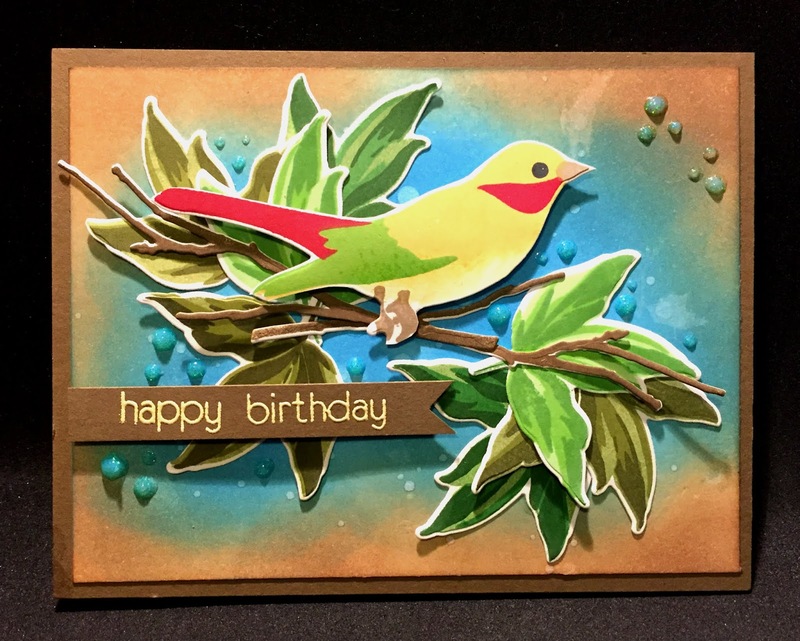 There are times when you want a real special card to give, and we feel this card is in that category. 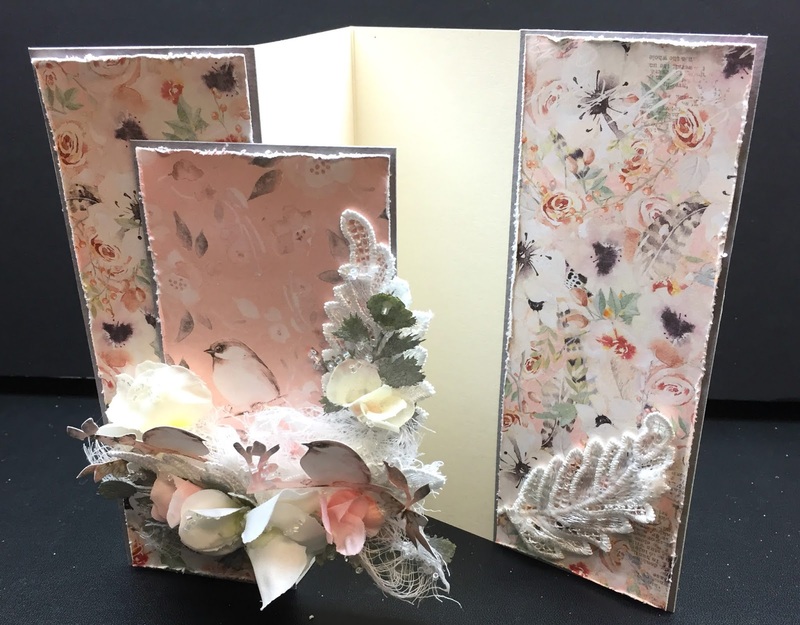 Using the feminine and beautiful Graphic 45 'Princess' paper, we will create an accordion trifold card that can be proudly displayed. 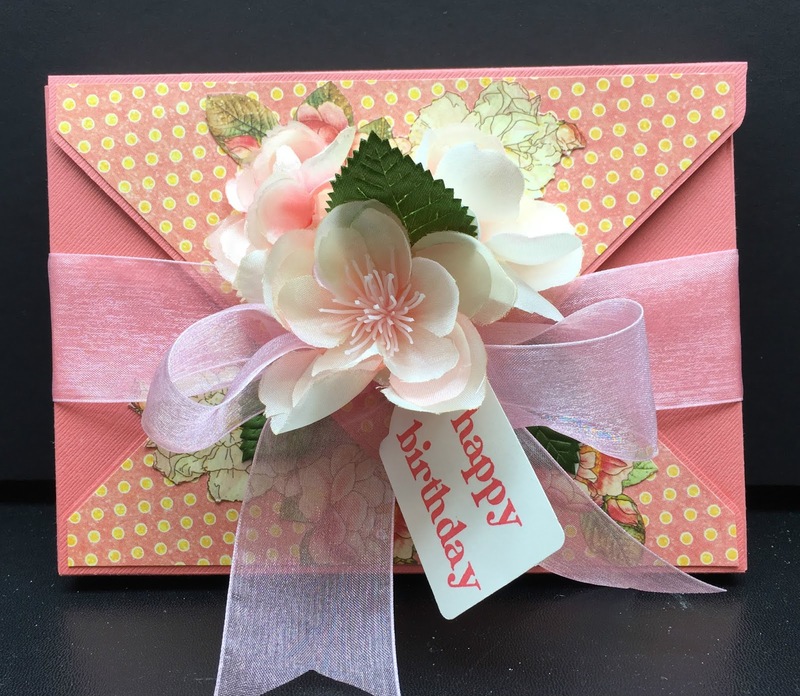 We will also create a beautiful envelope box to give the card in, and to store the card in as a keepsake. The sample has been made up as a birthday card, but can be made as a Valentine card, Mother's Day card, Thank You card, a card of encouragement, and more. This card can be given to any woman or girl at any age and be well appreciated. 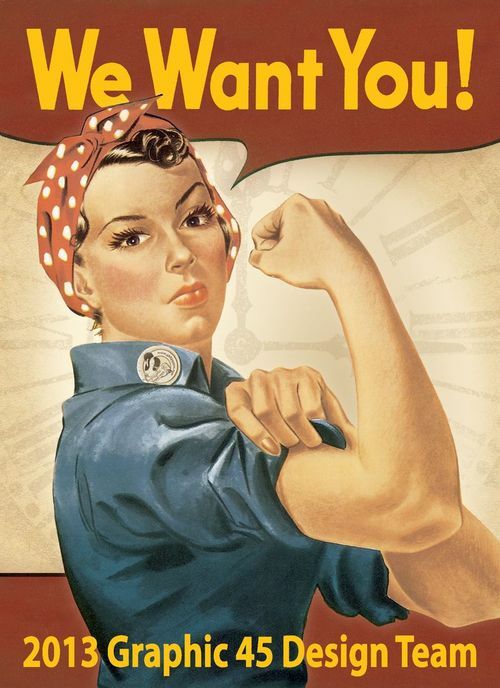 There is plenty of fussy cutting HOMEWORK which will be ready for pick up the evening of Thursday, February 7th. PLEASE BRING TO CLASS: Homework, craft mat, scissors, bone folder, double sided adhesive tape, liquid glue, white foam tape (& squares too if you wish, but the tape will work best for a lot of this project) OPTIONAL: something that is about 3/4" thick that is no more than 7" wide, like a notebook or paperback, a foam pad, or a stamp cleaning pad, etc. This will be used to insert into the envelope box as we create it to make assembly easier. Extra! Extra! Read All About It! 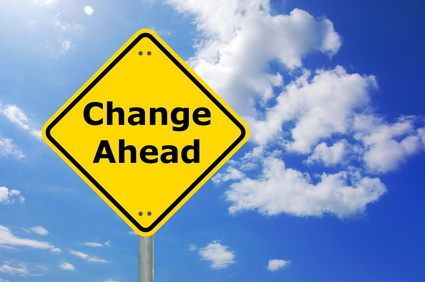 Changes Coming! This is happening sooner than I thought, and quite suddenly. I have been working towards an early retirement and a move back to where Dana lives, and despite certain delays in some areas of the plan, other things are moving forward quickly. I am moving back to Calgary! What does this mean? Well over the next two months you will not be seeing very many posts of creative projects made. It does not mean the blog is shutting down, it just means there will be a delay in seeing new projects. 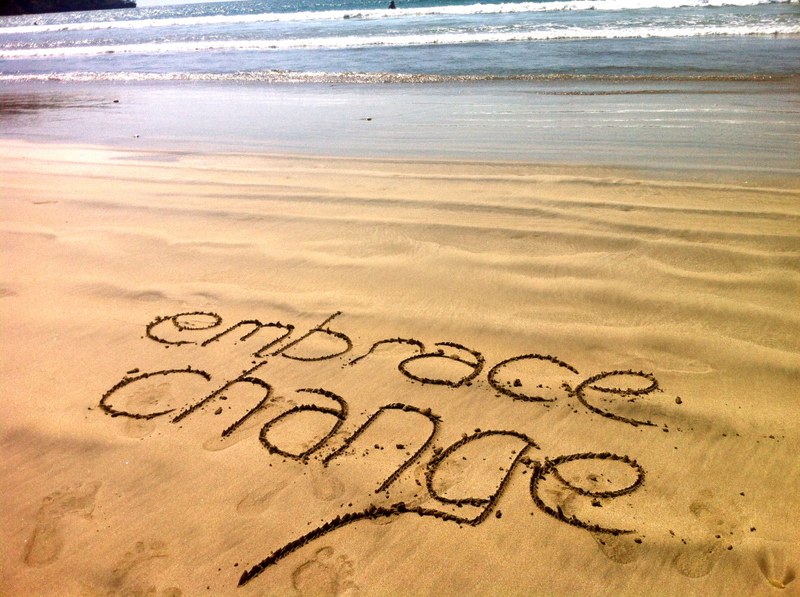 There are thoughts and ideas brewing around in my head for some other changes, but will not affect this blog. So if you will be patient, you will see more projects posted here again in the future. 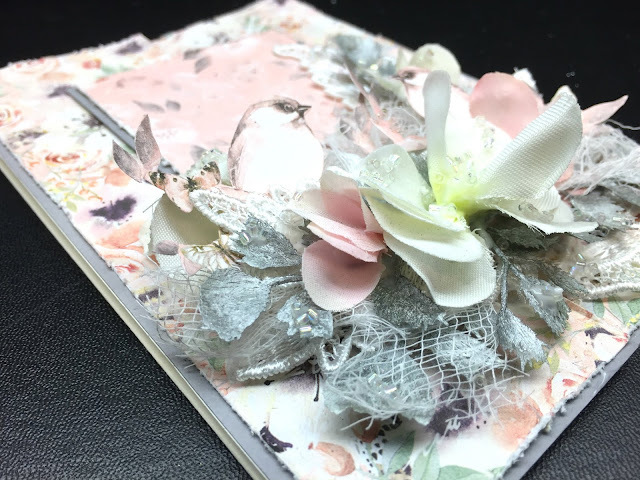 After February, I will no longer be teaching classes at Scrapbook Essentials, BC, but until then there may be a few more posts related to the classes I teach until I leave. I look forward to being with Dana and the grandchildren again, and to my new adventure. So in the mean time, if you are seeking inspiration, might I suggest browsing through the nearly 10 years of blog posts. On the side bar, click on a year and see what you find! 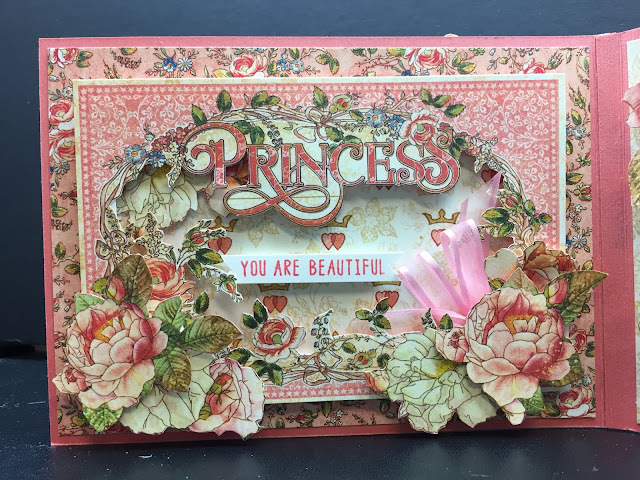 In my last post I mentioned that I was working on a special class project using Graphic 45's 'Princess' collection. With a few delays here and there, I finally have it done for you and share the class details with you today. 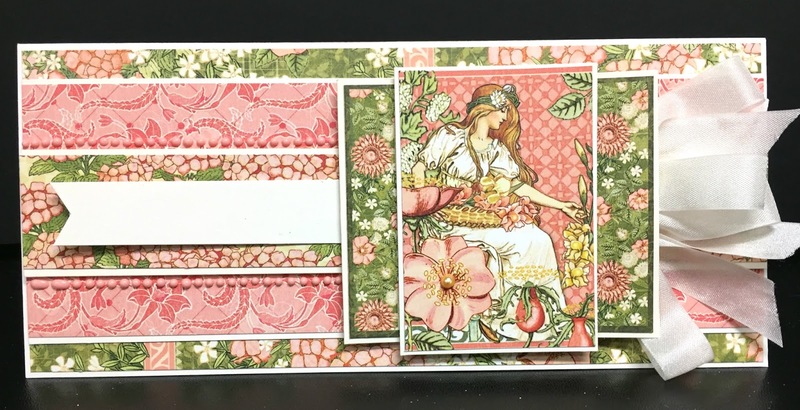 I will begin by showing you the envelope box and the trifold card folded up. There is plenty of fussy cutting HOMEWORK which will be ready for pick up the evening of Tuesday, February 12th. Now, for those that do not live here and can't attend, lets have a closer look at the project. Let's begin with the accordion trifold card. I must state that I did not take any side view shots to show the layering of this project because there were enough photos with just the straight on shots. I think you get a little bit of an idea of the thickness of each panel. Let's have a look at each panel individually, now. When open, you can see that there would be three more panels on the back of these three. Let's have a look at them as well. You see the front of the card here (on the right) and a blank cream panel meant for writing on, and the panel on the left of that. Let's look at that panel closer up. Well, that's it for the card. Hope you liked it. Now we can have a look at the envelope box for this card. 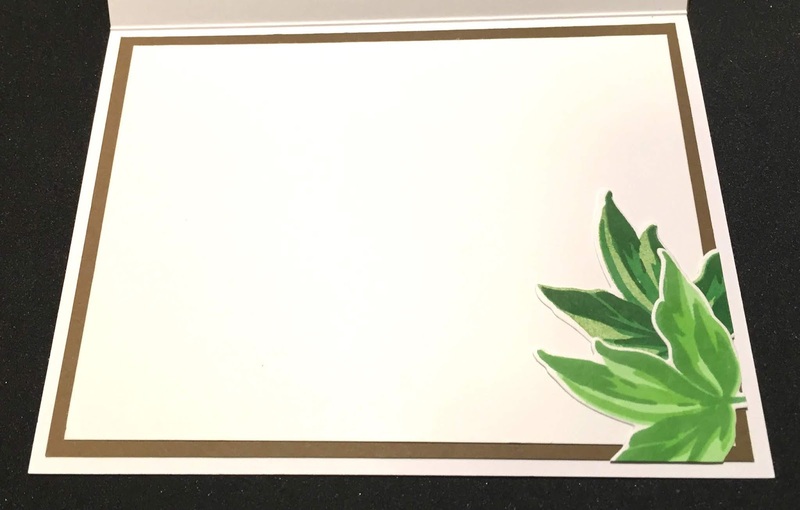 This is not normally the front of an envelope, but because I wanted to make an elaborate closure for the flap, it turns out to be more the front of the box envelope. Here is the actual front. 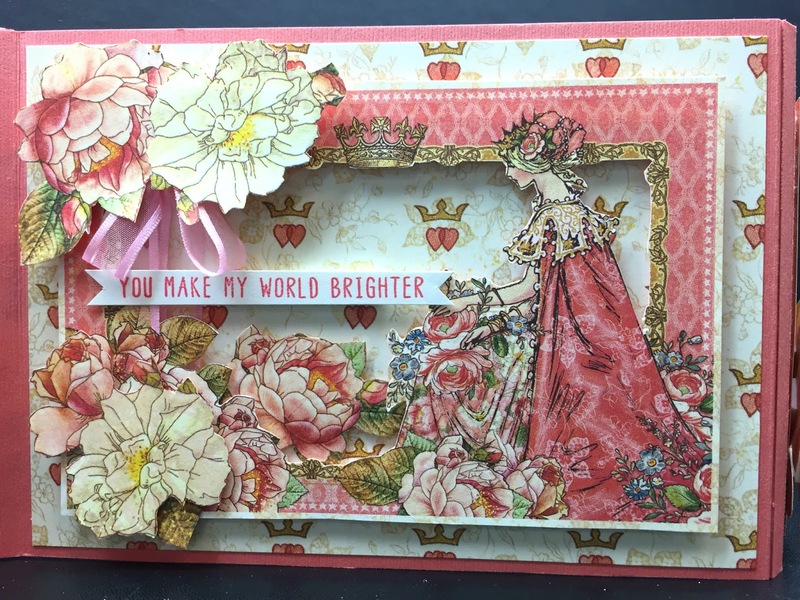 I fussy cut the entire 'Roses for Royalty' sheet for this project, so those taking the class will have a lot of fussy cutting to do, but I hope that you feel it is worth the effort and time to create a special card for someone. For those that register, I look forward to seeing you in class. For those that can not attend, I hope you are inspired. Thank you for stopping by today, and Happy Creating! I'm Back and Working On New Class Samples! I am back from my 15 day trip visiting family and am now starting work on some new class samples. I will be working with the new Graphic 45 'Princess' collection! The paper collection has those lovely pink/coral colours that we so love. 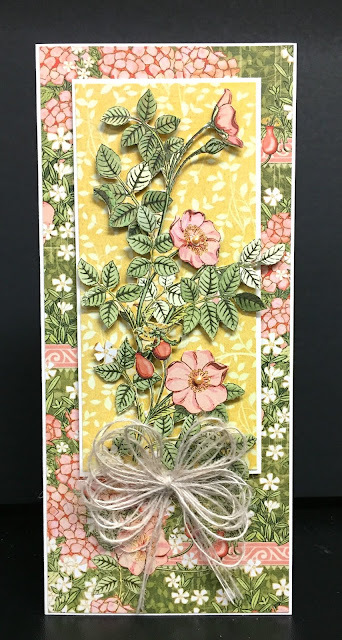 I am preparing something a little different for this card class, so be sure to watch for the class posting some time next week. 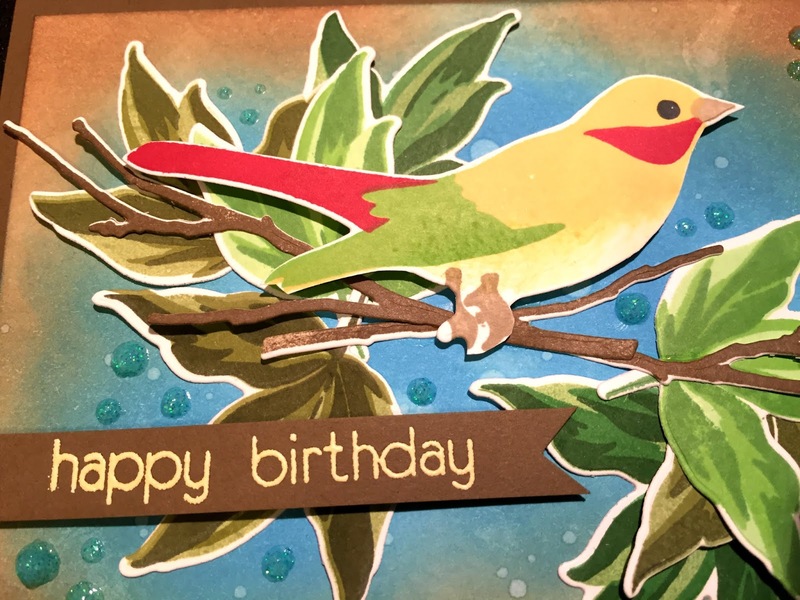 With G45 you have so many options when it comes to creating cards. With their cut-a-parts or ephemera pack, you can create simple or as detailed and layered as you like. So while I am creating, I hope you are creating something wonderful too. 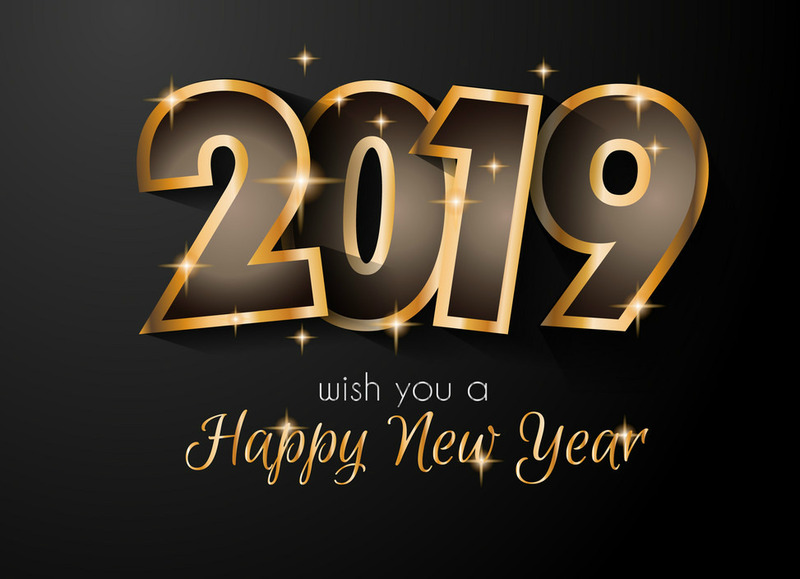 Dana and I wish you a very happy 2019 filled with wonderful happenings. I am enjoying my time with Dana and her family here in Lethbridge over the holidays. I am with my sister for New years, but will return to Lethbridge before going back to Sidney, BC. I am hoping this year will bring me something new that I have been planning for over a year now, but we will have to wait a little longer to see if it will happen. Classes are planned, with some samples completed and more on the way. So, watch for the classes coming up. Thank you all for following this blog for all these years. Welcome to another Shabby Chic class! 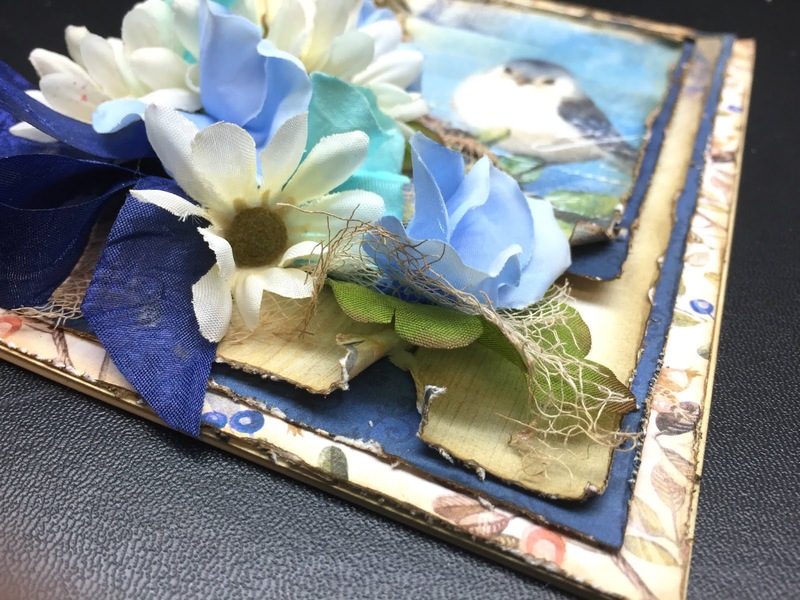 I love the papers we are using for this Shabby Chic class, and there is not a ton of flower fussing cutting! We will be using silk flowers this time round! I love the birds. 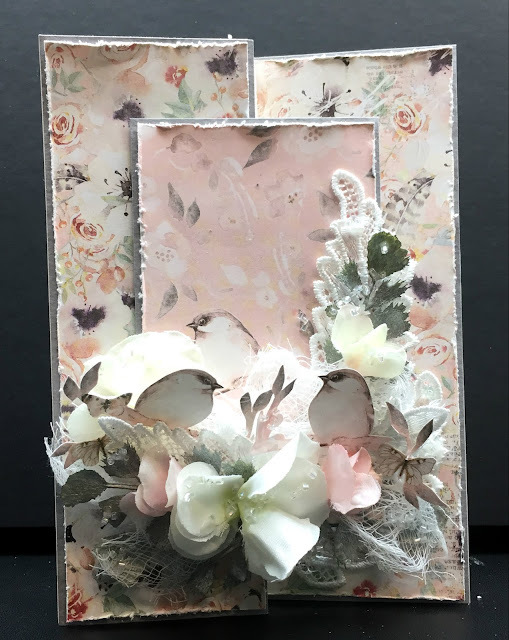 You may wonder about the space where you think something should be there; well that space is for the sentiment that you wish to add to your card at home. Hello Shabby Chic & Mixed Media fans! Come join us to create these 'way to thick to put in an envelope' cards! Aren't they gorgeous! NO HOMEWORK! 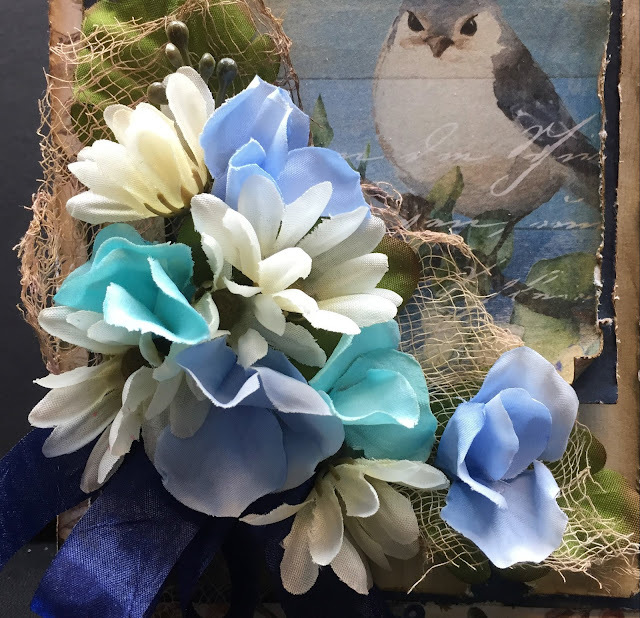 We will be using silk flowers, and the little fussy cutting there is we will do in class. Frame the cards, make beautiful card boxes for them, or give them as they are. 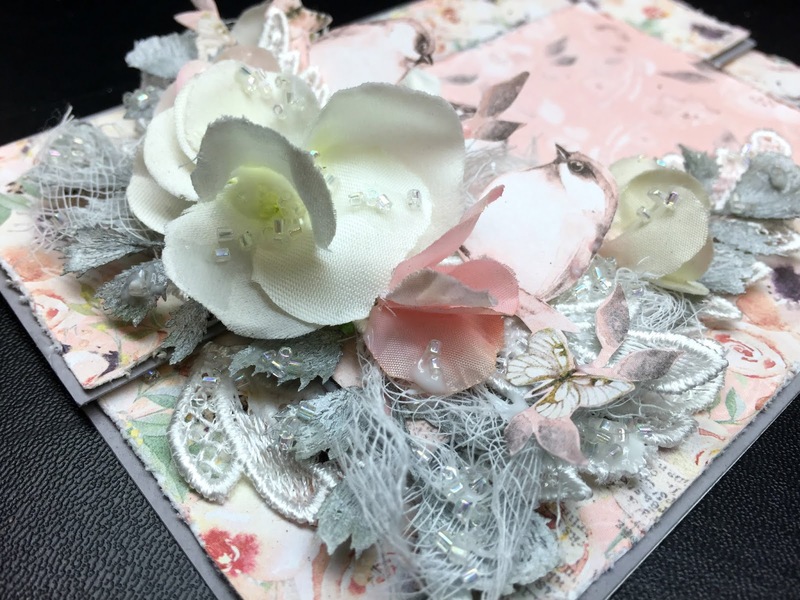 They make a beautiful gift card holder.... We will be painting more plastic, using NUVO Mousse, and using Gel Medium Matte to attach lovely, sparkly glass beads. Another fun thing we will do is learn how to colour cheese cloth! A Shabby Chic 'Z' Fold card. Aren't these cards beautiful? I am sure some special birthday person or mother or daughter, will love to receive one of these. See you there! 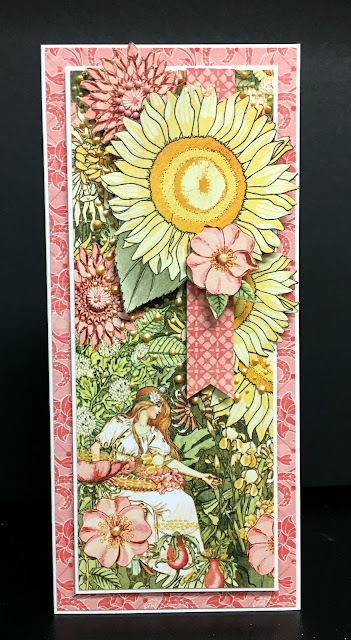 Rescheduling Graphic 45 "Garden Goddess" Tall & Skinny Cards & A Great Deal With Another Class! Remember yesterday's post? This post, and rescheduled class, coordinates with it and taking both classes will get you a deal on them both! 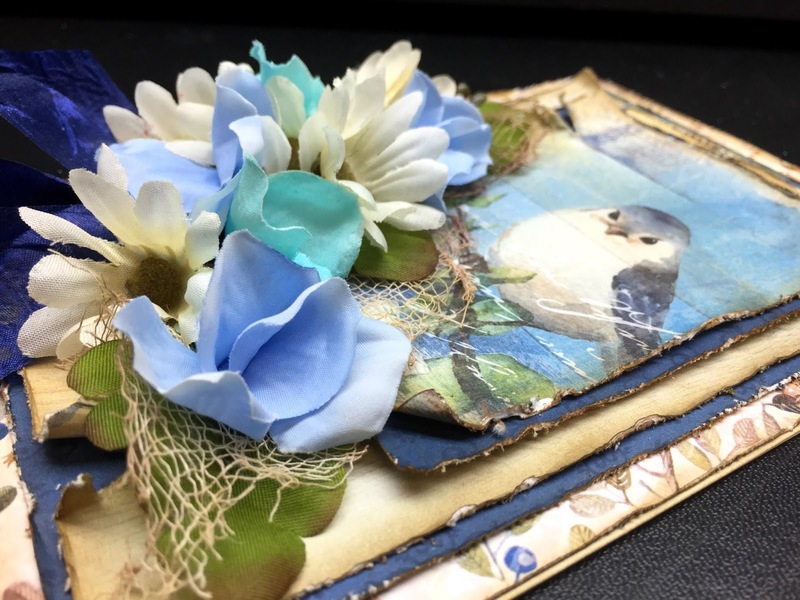 We are offering 2 special classes that can be taken separately or together at a reduced price. 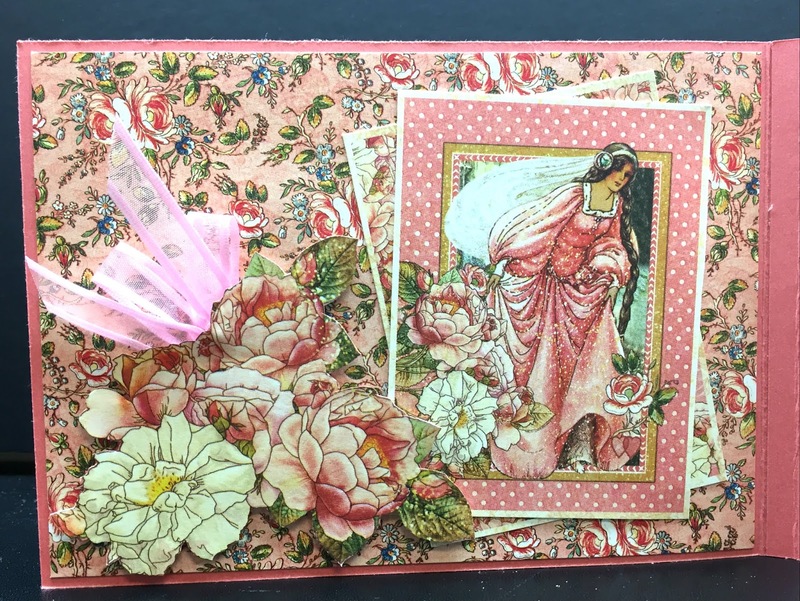 A card class, and a mixed media project. 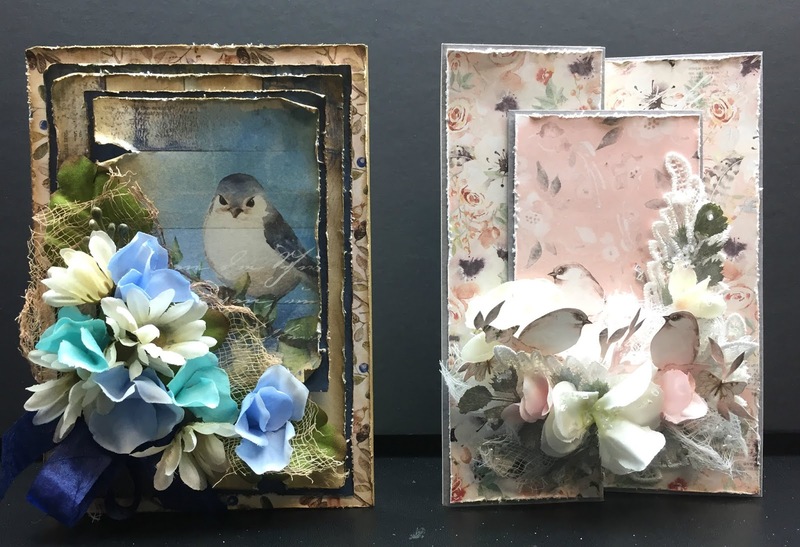 These would both make great birthday, or Mother's day gifts, or have a card that matches the gift you give! Be sure to mention when you register that you wish to take one or the other, or both. Your Homework kits will be made up for you to match your choice of classes. We are going to change up the size and shape of our card canvas for this card class! And we are creating with the gorgeous colours and papers of Graphic 45's 'Garden Goddess'. These feminine colours are such a joy to work with and will make your fussy cutting and layer gluing a more enjoyable experience for homework. 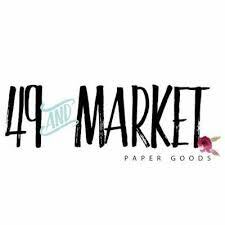 Your homework kits will be ready for pick up on Saturday, January 26th at the Crop. We will be making 4 cards in class, and you will have the supplies and instructions to make 2 more cards at home! 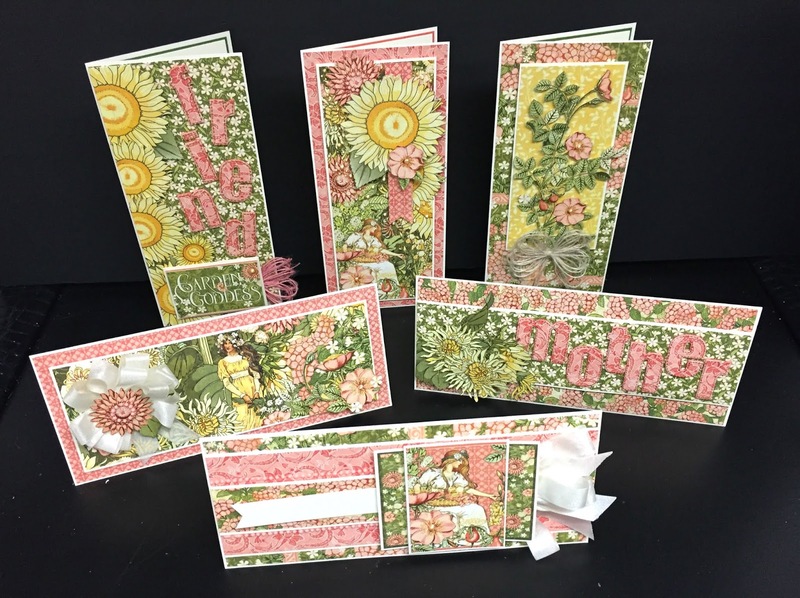 When you register for this class be sure to choose the word you would like on the 'mother' card - mother, friend, love, or thanks. These will be die cut for you and will be part of your homework. 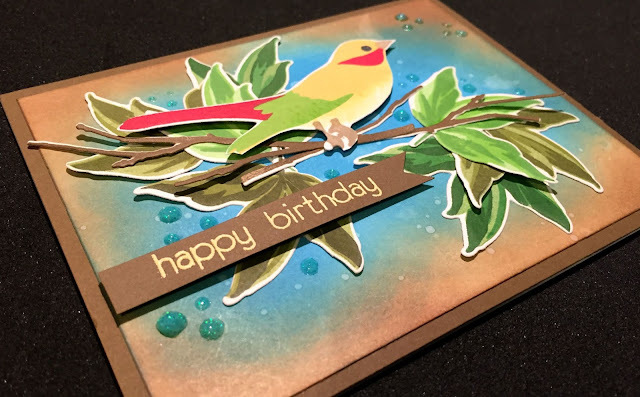 Envelopes for these cards will not be provided, but you can purchase business #10 envelopes in any colour you wish to use for the flatter cards, or create your own using your score board. Each card individually shown below, two of which will be made at home with instructions given to you. Hope to see you at both classes! 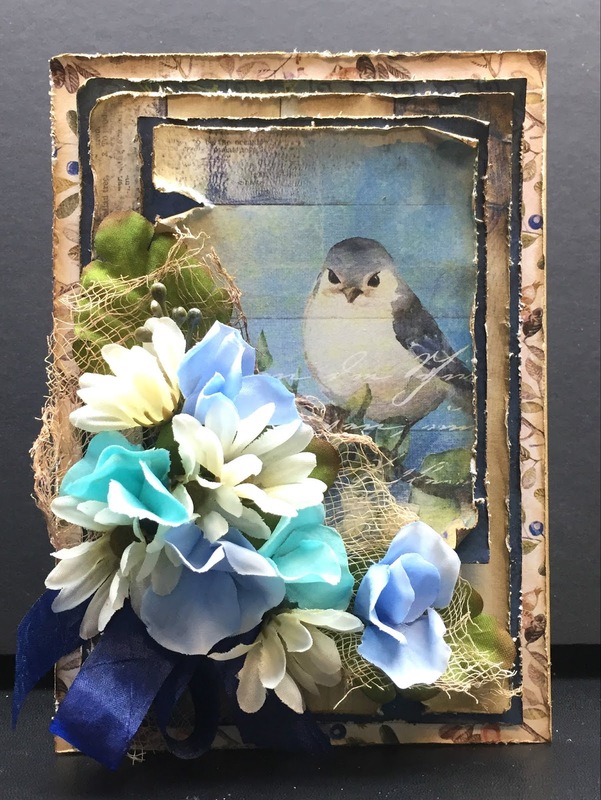 Cards, Scrapbooking Layouts, Mixed Media, Spectrum Noir, Watercoloring, Albums & Projects! 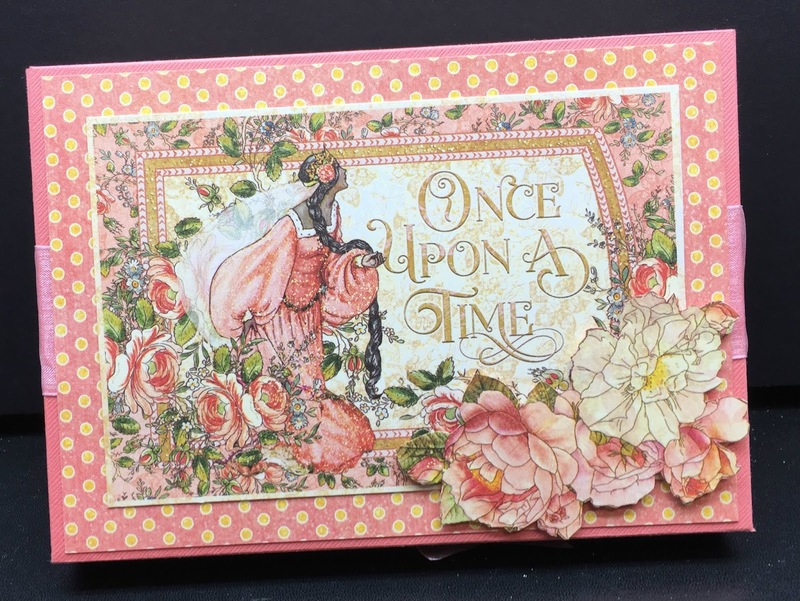 Wonderful layered stamps, dies, inks & more! 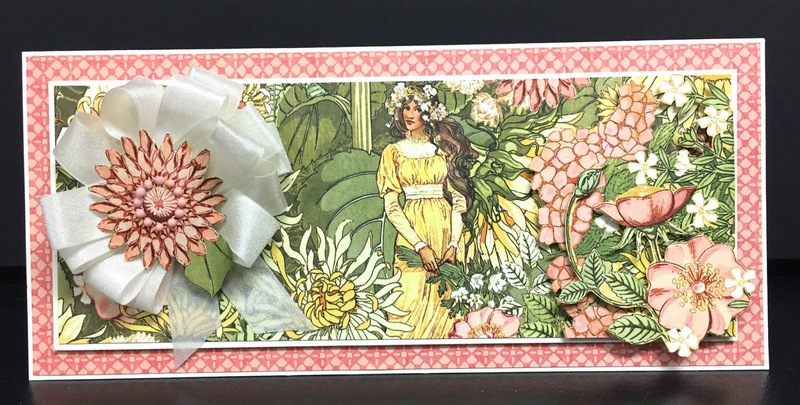 More gorgeous paper from Italy!